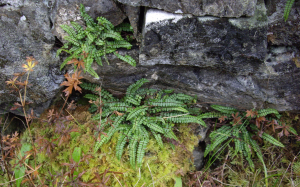 Observation - Maidenhair Spleenwort - UK and Ireland. Description: A number of these ferns were growing in and around the foot of wall by an old road now part of a nature reserve. Under a dissecting microscope you can make out the spores in the oblong spore cases. A number of these ferns were growing in and around the foot of wall by an old road now part of a nature reserve. Under a dissecting microscope you can make out the spores in the oblong spore cases.